Bolsa Chica Mobile Estates is a Senior owned community with no space rent and low HOA fees. 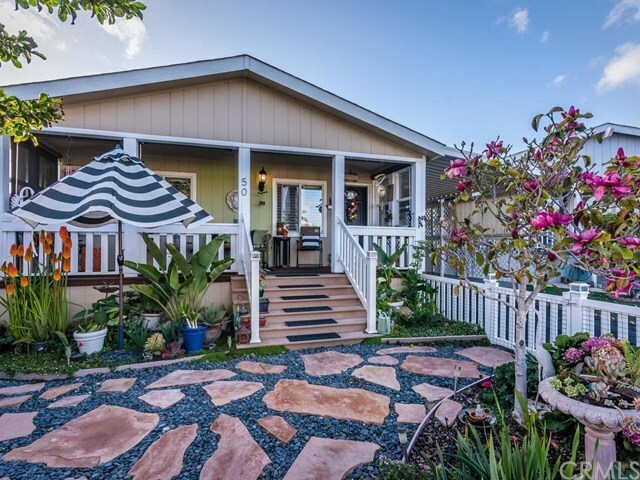 Adorable Cottage along the Arroyo Grande Creek within walking distance to the charming Village of Arroyo Grande. Immaculately cared for home with charm galore. Large living room opens up to the newly remodeled kitchen. Electric fireplace in the living room, new Zebra shades, Brazilian Cherry floors in living room, kitchen and hallway. Newly remodeled kitchen offers a breakfast bar, marble counter tops, recessed lighting, painted cabinets, custom light fixtures, newer appliances and the list goes on. Master suite offers a walk-in closet with built-ins, wood blinds, and over head light fixtures. Master bath has been remodeled with electric fireplace, enlarged tiled shower, sink and faucet, tile floor and counters, light fixtures, wood blinds and pocket door. Indoor laundry room with built in shelves for extra storage, doggie door to fenced back yard. Beautifully landscaped front yard, with river rock and flag stone walkways, low maintenance, fruit trees, irrigation system, a variety of mature trees and plants, not to mention, the yard is completely fenced! New front porch and steps made of Trex, newer exterior paint, storage shed. Furnishing negotiable. A wonderful place to call home. Information not verified.